Operators of new low-power FM stations coming to Seattle neighborhoods hope to advance “media justice” by giving voice to people and causes often overlooked by mainstream broadcast media. Whether you’re in Ballard or Kent, Duvall or Rainier Valley, a “hyperlocal” radio station is gearing up to bring new voices and fresh perspectives to the airwaves near you. 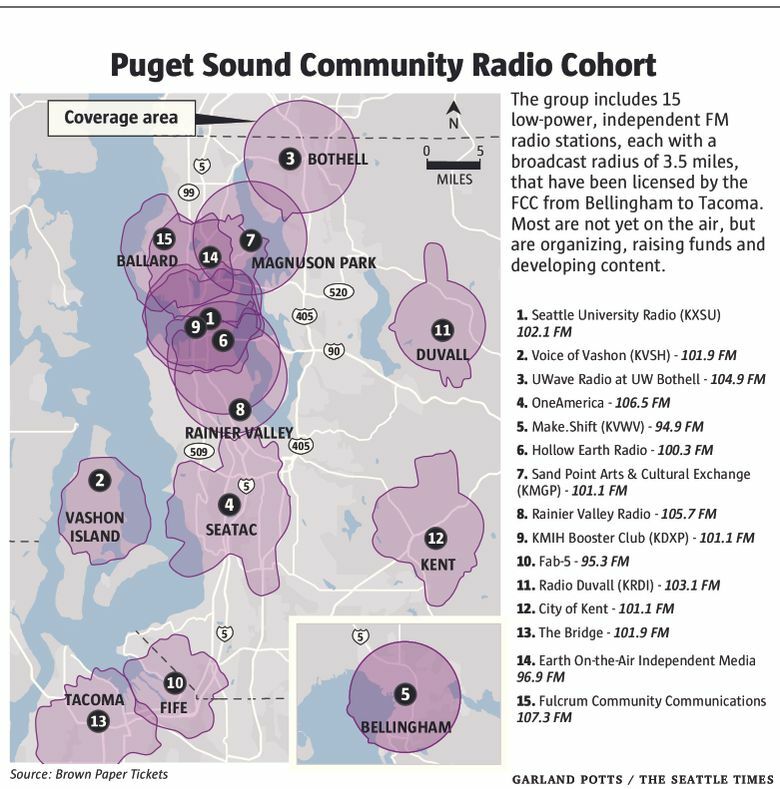 Fifteen low-power FM stations, each licensed to broadcast with the power of a 100-watt light bulb in an area with a radius of roughly 3.5 miles, have been sharing experiences as part of the Puget Sound Community Radio Cohort. Among their motivations is promoting “media justice,” giving voice to those often ignored by major broadcast outlets and media organizations. “Media justice means making sure everyone has access, particularly marginalized communities,” said Garrett Kelly, a co-founder of Hollow Earth Radio in Seattle’s Central Area. Seven of the 15 new stations are located in Seattle and will be honored at a “National Radio Day” event at 11 a.m. Thursday at the downtown Seattle Public Library. As these stations become a reality, their backers say they’ll explore the gamut: music, lifestyles, social causes, community news, politics, drama, food, hobbies and more. This hasn’t always been possible. 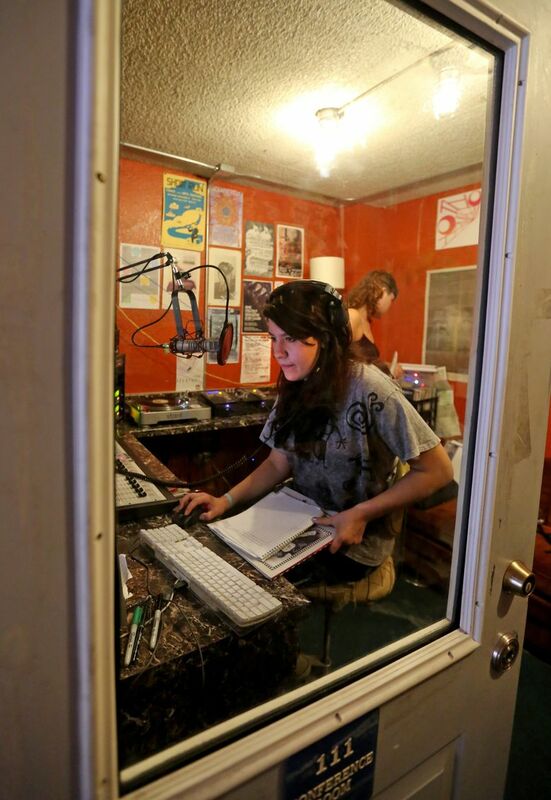 Sabrina Roach, an organizer of the radio cohort, said the key was the passage in Congress in 2010 of the Local Community Radio Act, jointly sponsored by Sen. Maria Cantwell, D-Wash., and Sen. John McCain, R-Ariz., and signed by President Obama in 2011. That law, which had been opposed by major private and public broadcast outlets, let groups in urban areas apply to create low-power FM stations, previously only allowed in rural areas. This will be the first time National Radio Day is observed coast to coast, with 30 cities participating, Roach said. At the Seattle event, a temporary “pop up” radio station will broadcast from the library’s Fourth Avenue Atsuhiko and Ina Goodwin Tateuchi Plaza. Young broadcasters will bring the station to life with music and interviews, and those attending could get a chance to hear what they’d sound like on the radio, and look over an interactive 6-foot antenna. Roach is working on the community radio project in her job as a “doer” with Brown Paper Tickets. The company has four such employees, hired to work on community-service projects in which they have a background. Some have been operating online, streaming their content on the Web. Among those is Hollow Earth Radio, born in 2007 in the basement of Kelly and his wife, Amber Kai Morgan. Initially, Kelly said, the focus was to give airtime to small and unusual bands that wouldn’t get play on commercial stations. That’s still important, but as part of a wide “media justice” effort, Kelly said. Among the shows on Hollow Earth Radio that illustrate that is “ #LuluNation + #SadBoisHypeClub,” a talk show geared to LGBT people of color. The FM signal will allow them to reach people who don’t have computers or aren’t on the Web. Carpenter is also the station’s youth-program lead, encouraging those new to radio to explore ways to connect with listeners. “In order for people to shine, they need to be able to experiment,” she said. Hollow Earth hopes to begin broadcasting on its assigned FM frequency, 100.3, next year. Encouraging new talent and new content is a goal of low-power FM stations, Roach said, and so is becoming a “community glue,” offering people a way to learn about and get involved in issues important close to home. Having a radio station in your neighborhood “is similar to the value of a public library branch in a neighborhood, or a community arts and culture center,” Roach said. It’s estimated that 90 percent of Seattle neighborhoods will be in the broadcast area of at least one of the new stations, and that many areas will be able to tune in to two or more. To survive and succeed, the new low-power FM stations face multiple challenges and hard work. Roach said it can take $60,000 just to get the station up and running. And stations are required to generate locally a significant portion of what they broadcast, and not simply act as “repeater” stations for national broadcasts. Eric Muhs estimates it will take the sustained efforts of 100 to 150 volunteers to create and maintain a station being established in Ballard that also would serve Fremont, Greenwood, the University District, and even reach to the north slopes of Queen Anne and Magnolia. Muhs, a physics and astronomy teacher at Ballard High School, said nonprofit Fulcrum Community Communications hopes to hit the FM airwaves next year. A core group has been brainstorming topics that could lend themselves to regular shows — such as a beer-oriented show, tapping the expertise of the area’s craft brewers. But like Carpenter at Hollow Earth, Muhs says much of the radio station’s long-term benefit may lie in what it means to the generation coming of age.